In my second blog post, I wrote a little console app that acts as a small webserver that allows Windows Store and Windows Phone apps to register themselves as a push target, and the console app can send push messages to these apps. In this blog post we’ll use Jer’s mono hack to get this running on the Galileo. First, we need to “install” mono on Galileo. Jump to Jer’s blog post and grab the mono_iot.zip file at the bottom of his blog post. Next unzip this file to the Galileo in a root folder like \mono\. 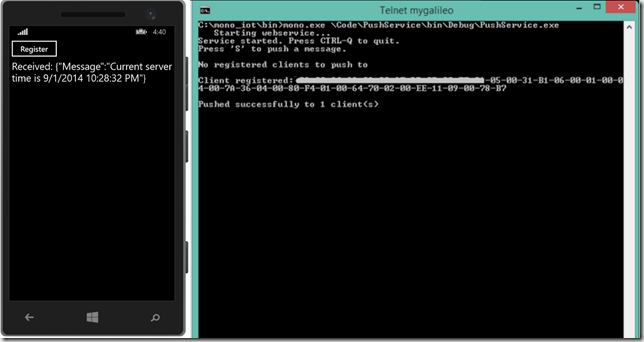 You can access the Galileo in a network path by adding \c$\ to the network path. Ie. unzip into: \\mygalileo\c$\mono\ (if your device name is ‘mygalileo’ or replace it with the name or IP number). If you haven’t done this before, you’ll be prompted for username/password. Enter “mygalileo\Administrator” and your admin password. That’s really all that’s required for ‘installing’ mono. Next, update the client store/phone app to point to the IP of your galileo device, and make sure it’s on the same network. When running the app, you should now be able to register with the push service. CTRL-Q to quit doesn’t seem to work. I’m guessing the CTRL key isn’t sent via telnet. You can just hit CTRL-C to quit the app. 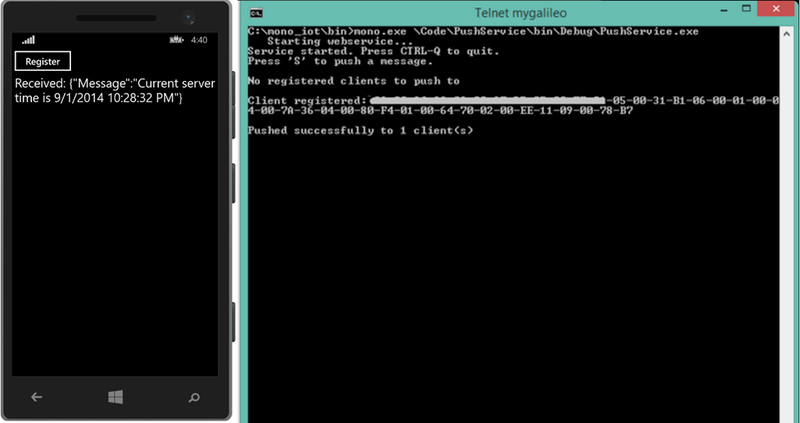 Now redeploy the app, and you can now get your Galileo to perform push messages straight to your phone or tablet! How cool is that??? This is all the starting pieces you need to build a small simple .NET based webserver for controlling your Galileo. At the same time it’s all you need for getting your Galileo to notify you of certain events occurring. Bottom line: It’s the first big step into a .NET based home automation controller. The next big step is to create the building blocks for a trigger –> event system, so we can start automating and monitoring our home with the power of .NET and Windows on Devices.